This is a nice old bus related postcard image! It is a 40's era linen postcard view. It pictures the interior of the old Lincoln Bus terminal at Lakewood NJ. Several men stand at the old soda fountain inside the station. Front reads "Soda Bar , Waiting Room , Interior Lincoln Bus Terminal , Lakewood , New Jersey". Back is divided and is postally unused. Condition is near mint to mint as shown! Any lines or waves are from the scanner and not on the actual image. Your item is shipped to you safely in a rigid mailer. A peaceful scene at Lakehurst, around the lake. In the distance is a hotel? 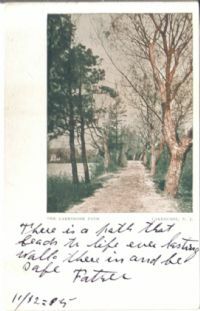 The front reads "The Lakeshore Path, Lakehurst NJ". Back is undivided and postally unused. Condition is excellent! 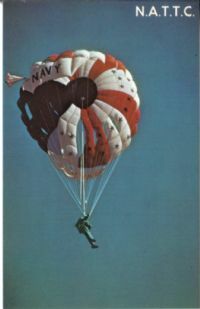 A nice 60's chrome image of a parachuter at the Naval Air Station at Lakehurst NJ. Back describes the training center and is divided and postally unused. Condition is mint! #255 Vintage 50's Shore Acres Brick NJ Speedboat! This is a super 1950's chrome postcard image of an old wooden speed boat out on the bay at Shore Acres New Jersey! This old image is a neat one! It pictures an early 1950's postcard view of the Barnegat Bay at Shore Acres Brick Township NJ. This view is a split image with sundown over the bay at top and a super wooden speed boat at the bottom, enjoysing a cruise on the bay. The front reads "Greetings From Shore Acres , N.J.". A beautiful Jersey Shore postcard view! Back of card is divided and is postally unused. Condition is mint! Any lines or waves are from the scanner and not on the actual image. Here is an uncommon Monmouth County postcard view! It pictues the old Reformed Church at Marlboro. Its an early card, probably from around 1910 or so. Back is undivided and is postally unused. Card is printed on very unusual postcard stock, very heavy with a fancy back. Condition is mint! Here is a nice old auto racing postcard image! Postmarked from Shiloh NJ to Roadstown NJ back in 1906, it pictures an early open cockpit race car, with crank at the front. It barrels down a dirt road, frightening a horse and carriage at right. A man carries a young child to safety. Card is artist signed. Card has divided back and is in good condition with light edge wear.